Brand new this luxurious villa have 4 bed/2 en-suite master, 3 bath and a heated pool with spa/hottub, sleeps up to 10 people comfortably. 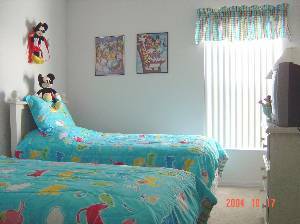 It is 10 minutes from Disney World and near all the major attractions. Gas BBQ, Highspeed internet, Gameroom, all you need for a perfect vacation. The villa is surrounded by the rolling orange groves by conservation area. It will have everything you need to provide the freedom and versatility you want on your holiday. There is a sofa bed situated in the family room. Cable TV, DVD, VCR, radio/CD player, Game Cube with small selection of games, movies and books in living area. fully-equipped kitchen. Pool table, Multi-Game table, Gas BBQ, Highspeed internet. 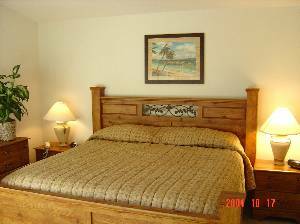 Our house has everything you need for a perfect vacation. The heated private pool has been extended to give you extra enjoyment. There is also an 8 feet diameter raised Jacuzzi Spa bath for the ultimate in relaxation. It is fully screened to keep the bugs out but allows the sunshine in. The east facing proximity of the pool and deck area guarantees Florida sunshine throughout the day for 12 months of the year. The stunning extended deck is one of the largest offered by any house-builder in the region. Overlooking orange groves, it gives a feeling of tranquility and peace, as well as a high degree of privacy. Patio furniture is provided. The pool also comes fitted with a child safety fence. 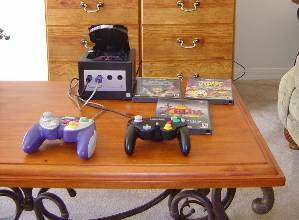 Gas BBQ, Highspeed Internet, Game tables, GameCube, DVD/VCR player, selection of games, DVDs, VHS tapes. Free use of High chair, crib and stroller. My family stayed in this home while on our Disney vacation in June 2009. This definitely was our home away from home. 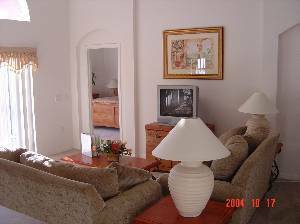 The spacious living room, kitchen/dining area, bedrooms, bathrooms...all were wonderful! It was great spending the day at Disney and coming home to a nice swimming pool to relax and unwind. Just a few minutes away from Disney, shopping and everything that you would need to make a fun vacation. We definitely recommend this location and the property management as being very responsive. We had a little problem with the hot tub the first night, but it was corrected immediately. This was a great value for our money. We stayed at this villa for a week in April 2006. It is exactly as it looks in the pictures. The king sized bed in the master bedroom was the most comfortable one we have ever slept in. The area was very quiet and relaxing. It was about 15 minutes to the Disney parks, a little longer to Sea World. We enjoyed it very much and will definitely rent from Helen & James again. Absolutely gorgeous property. 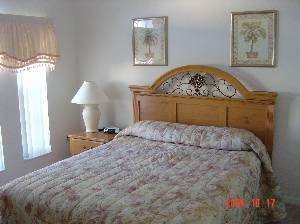 House is spotless and has all the amenities needed for a long term stay. Price was unbeatable for the quality of the accomodations. 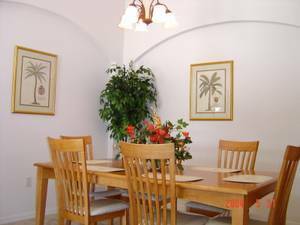 House is situated in a quiet community that is well manicured and very upscale. 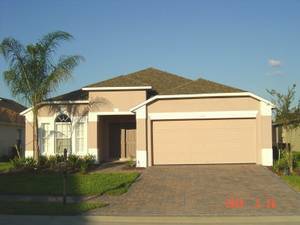 Located minutes from Disney and all other theme parks. All descriptions are 100% accurate about the house. Slept 8 people with comfort and privacy. Made our family Disney vacation one for the record books. Highly recommended renters, very willing to work with you on all details and extremely personable. This is a no risk proposition for perspective renters. Book this property with confidence you are getting your monies worth! Helen and James thank you for one extremely memorable visit to the Sunshine state! We'll be back. with the grandparents,sister's family and our own kids, the eight of us including children had plenty of space. This rental is in a brand new sub-division, two exits from Disney and about 15 minutes to Universal, grocery store right at entrance to sub-division. Owners are extremely attentive to details and willing to help in any way. A+++ experience. We are telling all our Chicago-land friends about this fantastic value. Thanks James and Helen for the memory of a lifetime.